In the 1850's, two of the premises on this site were vacant, a third was the residence of a William Kelly - possibly the tailor listed in local directories in the 1830's and '40's - and the fourth a public house run by James Boylan. The immediate lessor of all four was Patrick Quigly (sic). It's unclear whether he was the person of that name who, at the Summer Assizes of 1845, was compensated for two panes of glass broken in his shop window, or the Patrick Quigley of Bloomfield who appears under 'Gentry' in a directory from 1870. From the 1870's, the Buckley family were drapers here. In May 1886, Joseph Buckley announced the arrival of his Spring and Summer Purchases which included the latest styles in dolmans, paletots, stockinette jackets, cashmeres, flowers, feathers, aigrettes and bird's wings. And for the gentleman? Ties and scarfs in all shapes and colours, tweeds, woollens, corduroys, calicos and flannels. A few years later, another ad appeared in The Irish Times looking for an assistant (Protestant) for the Millinery Department. Joseph Buckley died in 1894, aged only 50. His widow Margaret Jane ran the business until it was taken over by Edghill & Smith who, according to a newspaper item in 1901, were 'maintaining the good repute which the house earned under the management of the late proprietress, Mrs Buckley'. They also had an admirable policy of supporting local industry: We will purchase any quantity of lace and Mountmellick Work if made locally. On the night of the 1901 Census, there were seven people on the premises: Meta Bruce, a milliner from County Fermanagh, who is classed as Head of Household; three saleswomen, Annie Seale, Bella and Mina Merdith; two salesmen, Willie Edghill and Joe Barber; and Katie Callaghan, a general domestic servant. According to an entry in the Valuation Books (dated 1902) the actual lesees of the property were Lemuel (the first time I've encountered that name outside Gulliver's Travels) Edghill and William Smith. 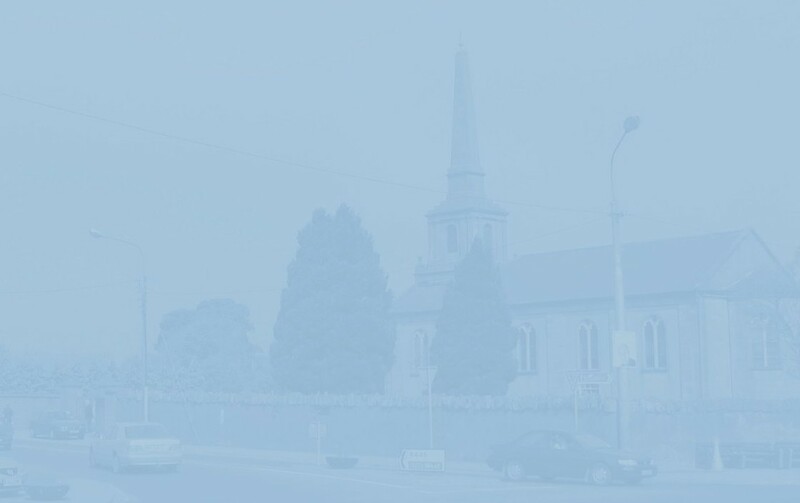 By the time of the 1911 Census, the Edghills had departed from the Queen's County and Lemuel, a native of County Kildare, was a provision merchant living at 91, Marlborough Road, Dublin. In 1904 Shaws (who we've already met back up the street) bought Edghill and Smith's business and, by dint of much expansion and refurbishment, established itself as one of the town's premier business establishments. Today, the family company has fifteen outlets in a dozen counties. It is, to quote their slogan, 'Almost Nationwide'. On the premises on Census Night 1911 were William Henry Shaw, his sister Isabella (who is actually listed as his daughter), eight staff members (six Episcopalians, a Quaker and a Methodist) and the inevitable Catholic servant. This should not, however, be construed as naked discrimination, rather as proof of the rampant religious tribalism of the times. The employees of the Catholic-owned Aird's Hardware, Aird's Hotel, Kelly's Bakery and the Hibernian Hotel were, for instance, without exception, Catholic. On a lighter note, an advertisement from Shaw's early days in the town guarantees the very best value all the year round and poses the immortal question: Do you know if your corsets are right, or do you just guess? One of my elderly informants recalled that the female staff lived in a sort of dormitory over the shop. She also remembered a housekeeper, Mrs Ploughman, and a Mr Dallas who was married to Isabella Shaw. He was William John Dallas (1886-1958), a native of Inverness, who appears in the 1911 Census as a tailor's cutter, and eventually became a director of the firm. The Dallas family lived in Tower Hill, opposite the Christian Brothers School. It's hard to believe now, but, at the rear of the premises, there was once a farmyard where pigs were kept, and cattle were driven in from Onion's field (since 2000, the site of the People's Park) to be milked. The produce was used in the staff canteen which was in operation here until the 1970's. In 'the olden days' too, Shaws made deliveries via donkey and cart. One of the donkeys - presumably a peaceful creature? - named Gandhi was still remembered by one the people I spoke to. In 1954, Shaws took over Gaze & Jessop's Hardware in Church Street and, in 1973, moved to the newly-constructed Centrepoint on the Mountrath Road where they developed the furniture and white goods aspect of their business. In that decade too, they opened ATR, a tv rental and retail outlet in Centrepoint. In the 1990's the hardware section was leased to local businessman Joe Ging. Ging's subsequently moved to Kealew Business Park and, today, Centrepoint lies empty. After William Shaw's death in 1929, his brother Samuel ran the business until he, in turn, was succeeded by his son Mervyn. Today, the latter's son, Andrew, is manager of the store, representing the fourth generation of Shaws' involvement with the town. In August 2013, the family took the historic step of transferring its business from Main Street to the former 4 Home Superstore just off the south side of James Fintan Lalor Avenue. 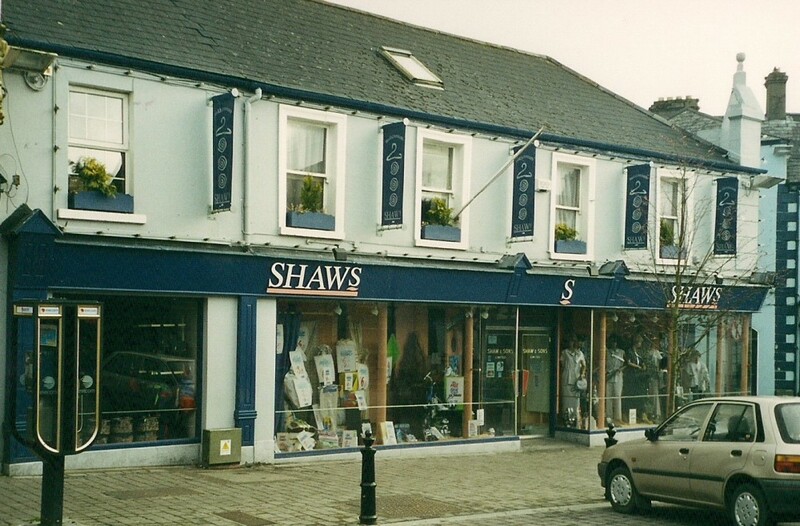 A prominent part of the fabric of Portlaoise for more than a century, Shaws will be a great loss to the Main Street, but the family's continued presence in the town is to be warmly welcomed. On November 14, 2013, the Leinster Express reported that the former Shaws premises had been acquired by the County Council as the site of a new library. Mammy look what I got! Look, Santy drank the stout! And Rudolph ate his carrot!